STEM toys seem to be popular this holiday season. Check out this microscope you can win. Open to US residents only through 11/19. Good luck. The My First Lab Microscope is a Powered by Mom 2017 Holiday Gift Guide Pick. Stop by our Gift Guide to see some other fabulous gift ideas. 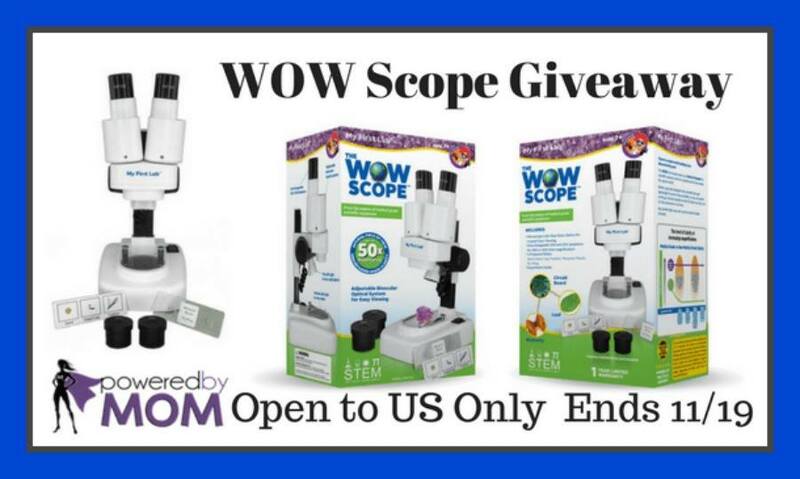 The WOW Scope comes with one slide with 2 specimens and 1 card with three 3D objects and a carrying case. You have two sets of eyepieces with 10x and 25x magnification. The two bright LED lights throw every detail into clear view. Now don’t forget we have a ton of other fabulous giveaways going on right now just look on the right-hand side of our page to see all the giveaways. Now for the really fun part. One lucky winner will receive a WOW Scope, the My First Lab Microscope. Enter on the Giveaway Tools Below. Remember to come back for the daily entries. My kids would probably look at many things, insects and more. Probably plant cells on leaves and such greenery. insects, I love closeups of insects, all of their details. A drop of blood would be very interesting. Rae Nelson.